has us falling in love with them all over again. Shannon and the Clams originally stole my heart when I heard the title track off their debut LP, I Wanna Go Home, in the summer of 2011. The playfully bratty and stubborn nature of the song mixed with Shannon's wails of "hooooome" made me swoon and helped me get through boring train rides in and out of New York. Instead of trudging through the bleak New Jersey landscape, I imagined I was cruising in a convertible along the coast or flirting with boys at a sock hop. It's obvious that Shannon and the Clams sound like they could've transported to 2013 via a time machine from the fifties and sixties; their surfy guitar and doo-wop melodies could've easily soundtracked the lives of heartbroken teens all over America. And while Shannon and the Clams aren't the only band that heavily draw influence from those decades, they're one of the only bands who are able to take a distinct sound, slightly warp it to make it a little crazier, and take it for their own. It's extremely rare for a band to fuse a handful of genres that are constantly trying to be emulated and have it come off as something fresh and exciting. Shannon Shaw and Cody Blanchard are terrific at writing and crafting songs that are timeless regardless of how "vintage" they sound. When we first heard that a new Shannon and the Clams album was coming out in the spring, I told Diana there was simply no way I wouldn't like it – and I was right. 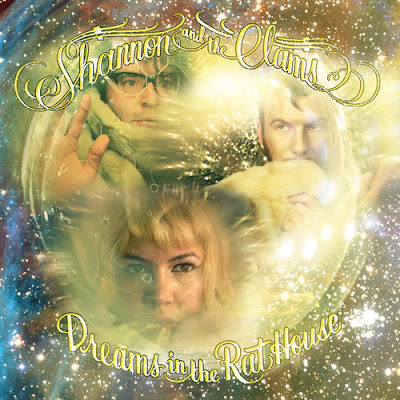 Dreams in the Rat House is the third LP from Shannon and the Clams and their first on Seattle's Hardly Art. I tried to figure out what a "rat house" was exactly and Urban Dictionary informed me that it was a "home for domesticated rats." I read in an interview with Shannon and Bust Magazine that when they were recording this album, the band was alone in a cabin with only the company of a mouse. Regardless of the origin of the album title, Dreams in the Rat House finds the Clams clan doing again what they do best. "Rip Van Winkle," one of the first singles to come out from the album, is classic Clams with jangly tambourines and guitar that accelerate right before the chorus. But they don't strictly stay within any mold on this album – like on "Bed Rock," the band gets pretty terrifying when they howl "bed rock" over and over. "Rat House" is another track that winds them into the direction of spooky punk but they reel it in to show off their softer, more emotional song on the balladesque "Unlearn." My all-time favorite on the album (which is hard to choose) is "Heads or Tails," a rambling tale of declaring independence over a sweet harmony of "do what I want" which culminates in Cody shouting "I don't need a house / I don't need stuff / I don't need love / I don't need a bank / I don't need books / I don't need you." Seriously, this whole album is gold. Shannon and the Clams, you win me over once again. Buy Dreams in the Rat House via Hardly Art.